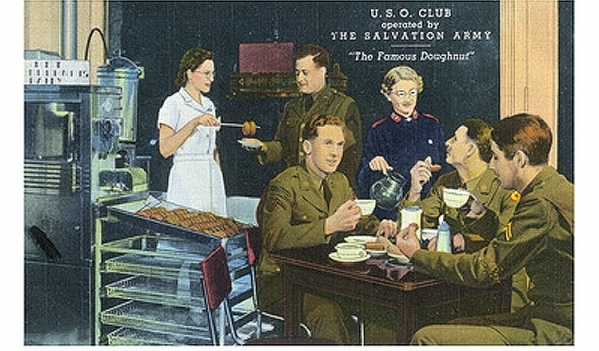 "Together [these entertainers] constitute the vast composite known as USO-Camp Shows, Inc. Organized in November, 1941 as this war's answer to the last one's mistakes (too little which came too late to too few), Camp Shows see to it that as much entertainment as possible reaches as many soldiers as possible - in contrast to the fact that the last war produced only an Elsie Janis (You can read about her here)... The money to run Camp Shows comes from the National War Fund; the authority to use its services rests with the Army and Navy." Attached is a 1944 article from CLICK MAGAZINE about the touring performers of the U.S.O. during the Second World War. Illustrated with eight photographs picturing many of the most devoted and well-loved of the Hollywood entertainers (Bob Hope, Martha Raye, Al Jolson, Jack Benny, Wini Shaw) the article, by celebrated newspaper critic Leonard Lyons, goes into some detail as to the deep sense of gratitude these show people felt and how happy they were to give some measure of payback. It was estimated that the U.S.O. performed 293,738 shows by the time the war reached an end. A post-game interview with Hollywood star Marlene Dietrich (1901 � 1992) concerning all the many places throughout the European Theater of Operations that she performed before Allied audiences, at times performing very close to the German front line. Four years after his stellar performance as the Scarecrow in "The Wizard of Oz" (MGM, 1939), Hollywood actor and comedian Ray Bolger (1904 � 1987) was performing in many parts of the war-torn Pacific islands on a USO tour for thousands of very grateful GIs and Marines. Attached is a two page reminiscence about one particular Guadalcanal performance, the men he met and the Hell they paid in the years that followed. They're not with the U.S.O. but the barracks-happy GIs were delighted to see them just the same.